I want to start with a reassurance  a Health and Safety statement. Benzene is regarded as too toxic for use in schools. Fine; we can use other things. I was heavily criticised in1998, in a letter to an august chemical journal, for having set an A level question on benzene; it was said to be more appropriate to 1898 than 1998. Apart from the fact that I am liable to regard this as something of a compliment, benzene and its reactions are in most syllabuses, and so questions on it are not only legitimate, but necessary. The reassurance? Benzene may be toxic; its symbol certainly is not. What is its symbol, and its structure? This was a significant problem in the 19th century, and the story of its resolution has been well covered elsewhere. Anyway, the nature of benzenes reactions are familiar enough and lead to the notion of delocalisation of electrons around the ring. Firstly how should this be represented, and secondly how can a common misconception be corrected? There are two in common use, the version where the delocalised electrons are represented by a circle within the hexagon, and the Kekulé form where alternate single and double bonds are shown. I prefer the Kekulé version. This preference has been criticised at meetings  How do you show the delocalisation? I dont, and nor do I see any reason to do so. The Kekulé structure represents benzene, and everyone who uses it knows that, and if they have studied the chemistry they also know that it isnt cyclohexa-1,3,5-triene and that there is some sort of delocalisation. It is no more or less misleading than using the circle version, which implies that the electrons in the p-bonds are uniformly distributed around the ring. They arent, so I could easily argue that the use of this is just as wrong. It is in fact no more or less misleading than using C to represent carbon. Carbon atoms arent C-shaped, but we all know what we mean. It is also true that mechanisms such as electrophilic substitution, say the reaction of NO2+ with benzene, are easier to draw unambiguously using the Kekulé form. Anyway, you choose; the exam boards dont care. Just dont regard the Kekulé form as wrong. Its only a symbol for what is actually a colourless, rather pleasant-smelling, volatile and flammable liquid. That is why it is an aromatic compound. If the structure of benzene is represented at all in terms of orbital overlap, the picture that is drawn is usually that of a hexagon with a doughnut above and below the ring to represent the delocalised electrons. Maybe you have not asked the question; or maybe you have assumed, or have even been told, that it is six. Only two electrons-worth of delocalisation are in the doughnut, the other four being in two other molecular orbitals. Now you know why I prefer Kekulé! Choose for yourself, remembering that both sybols, Kekule or delocalised, are just representations. Follow the link to find out about Kekule himself. 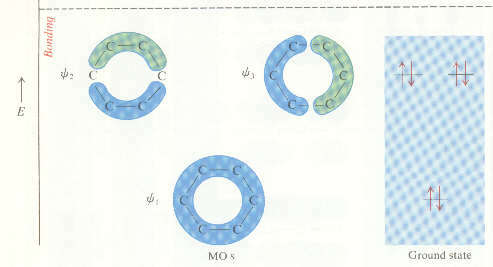 The illustrations of the orbitals in benzene are from Morrison RT and Boyd RN, 'Organic Chemistry', 5th ed; Allyn and Bacon Inc., 1987; the cartoon appeared in Education in Chemistry in March 1999.